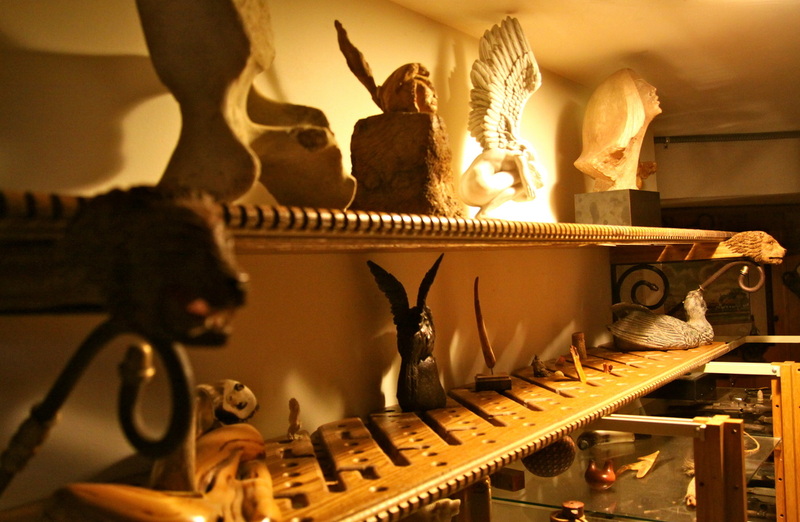 A museum of artifacts, objects of art and oddities occupies half of my studio. Having space limitations, I needed to design shelves that were both functional and would allow light to project through to the objects below. I did not want identical shelves, but rather each designed with its own character, so I bought a hand-held router and set forth to learn how to use it. The notched edging for the shelves came from examining oak moldings in the Studebaker Estate in South Bend, Indiana. The shelf brackets came from an antique store and originally had rather human-looking carved lions (see the works in progress section). If you would like to see how the lions were created, the work in progress images are available here.